The future of our continent depends on the future of our natural heritage. It is only with the help of its donors that the Trust, in support of the work of the College, can equip new generations of conservationists with the skills needed to address the challenges facing conservation across southern Africa. The aim of the Trust is to support education in nature conservation at the College. The Trust works to grow its fund, to provide an increased disbursement to the College annually and ensure the sustainability of its vital work. 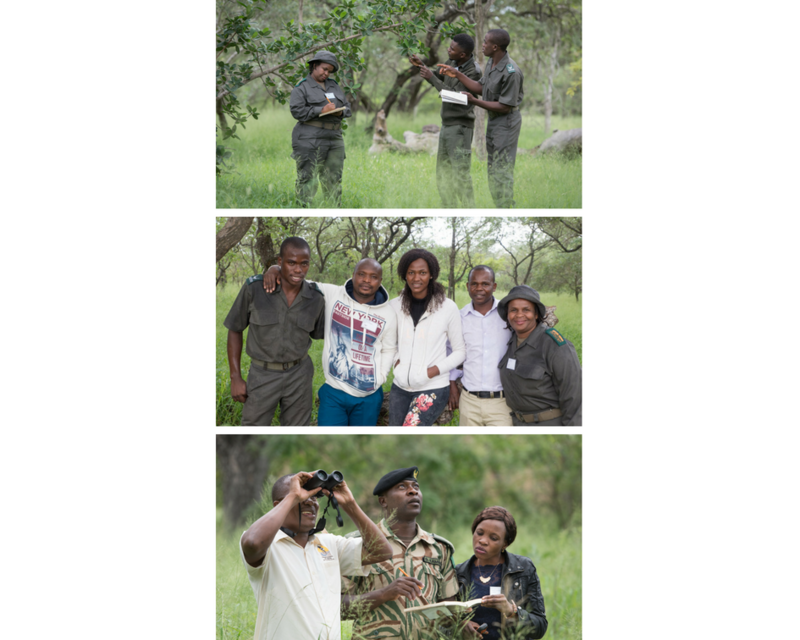 All of this to impact nature and wildlife conservation across southern Africa, now and into the future. The Trust is administered by WWF South Africa. A dedicated part-time fundraiser works in conjunction with the executive manager of marketing and fundraising at the College and bi-annual meetings take place with the chair. An annual meeting of the trustees ensures good governance and the success of the Trust. The following entities are entitled to be represented by nominated trustees: World Wide Fund for Nature (WWF-SA), Peace Parks Foundation (PPF) and IUCN (Eastern and Southern Africa Regional Office) and the WWF Regional Office for Africa. Southern Africa is blessed with a uniquely rich natural heritage. Community development, climate change, poverty and the growing demand for protected commodities like rhino horn, all impact Africa’s valuable resources. It’s vital to equip the custodians of our natural resources with the skills to tackle these challenges. The College does not receive a government subsidy, leaving it dependent on external funds. At the suggestion of the Late Dr Anton Rupert, WWF South Africa established an independent trust in support of education in nature conservation at the College, with assistance from founder trustees and long standing donors both locally and internationally. The Southern African Conservation Education Trust (SACET) deed was registered in 2000. In 2011 the name of the Trust was changed to the Southern African Wildlife College Trust (SAWCT) to better align the Trust with the College. SAWCT has historically followed the investment strategy of WWF as advised by its Investment Committee. This diversified strategy across the various asset classes and geographies has proven beneficial in terms of inflation beating financial returns over the years. In March 2015 the trustees agreed with WWF plans to restructure its investments into the Prescient Living Planet Fund. The primary objective is the delivery of long-term capital growth within a framework that reflects a high level of sustainability and environmental integrity, without compromising investment performance. 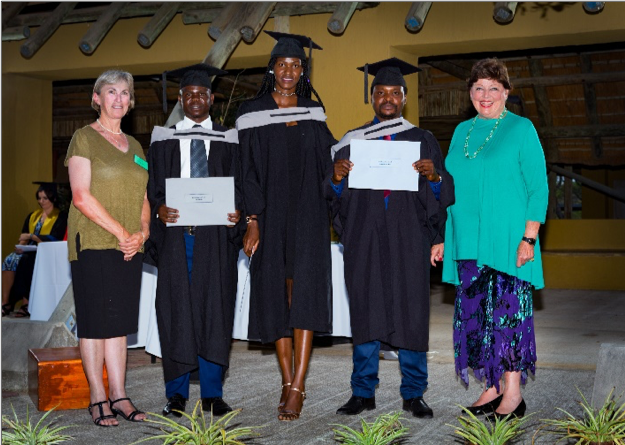 Over the past 18 years, SAWCT has awarded over 60 scholarships and bursaries to the College’s top students. Financial support from donors plays a critical role given that conservation education and training is not well funded in southern Africa. The Trust takes regular steps to review its investment, fundraising and communication plans, to ensure its growing and continued support to education in nature conservation at the College. Financial support provides students with the opportunity to further their studies and impact nature conservation across southern Africa according to best practice. Recognised qualifications equip graduates to excel in their work, grow in their careers and influence conservation at policy making level. Their income and quality of life improves, and much-needed benefits flow to their families and communities. Please help us grow the Trust to support education in nature conservation at the College in perpetuity! Bequests from the deceased estates of South African taxpayers are exempt from donations tax and estate duty. Donations from South African taxpayers are exempt from donations tax, and may be claimed as deductions against taxable income, subject to the limitations of the Income Tax Act. We would like to acknowledge your valued support – please contact us! Donations are acknowledged in the Trust’s Audited Financial Statements. Each donor’s contributions are also tracked cumulatively to show their overall “giving status” which is recognised in our Annual Report. It is also on the Trust’s donor plinth situated at the entrance of the College. 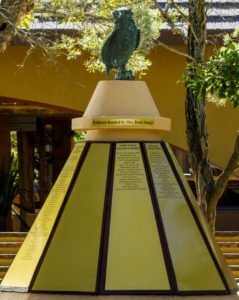 The plinth (photo right) is crowned by a superb sculpture of a Bateleur Eagle created – and donated – in honour of all SAWCT donors by renowned bronze and wildlife sculptor, Rosie Sturgis. Join us on a visit to the College to experience its work first-hand and to meet the passionate people behind it all. We are pleased to share this recent feedback from alumni who attended the College a few years ago, and attribute their success to their studies. 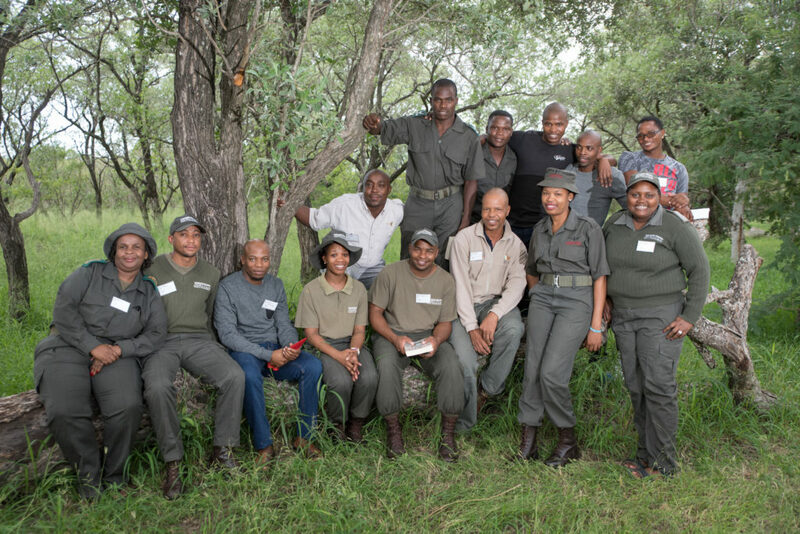 Having studied at the SAWC for two years (2011 and 2012), I acquired the necessary skills to manage a National Park with its different components, (human resources, game, finances, and different land-use practices). Upon completion of my higher certificate in 2011, I was awarded a scholarship from the Southern African Wildlife College Trust (SAWCT) to continue with the Advanced Certificate in Nature Conservation. I am now able to implement an integrated management plan, and enthusiastically plough back the skills I got to ensure that wildlife does co-exist with other land uses. I strongly urge other organizations to consider supporting ambitious and enthusiastic students who have a passion for nature and want to sustainably manage Africa’s biological diversity for future generations. I returned home to my work in Matobo National Park, Zimbabwe, and was given the opportunity to show off my new skills and enhance a neglected campsite around a dam. Together with support from my colleagues, it was recreated into a place visitors would want to spend time. In early 2008 I was promoted to a supervisory role, planning and executing anti-poaching and law enforcement activities of the park, planning and grading roads and fireguards, planning and executing early and late burning programs, as well as managing game water supply. I can only say thanks to the SAWC for equipping me with relevant and key skills. Poaching has been reduced, areas lost to wild fires have not gone beyond 11% annually, and deaths related to lack of surface water are negligible. Progress in my career has helped me provide for my very healthy and happy family, with three kids all going to school. Thanks to SAWCT I have been given a life line!